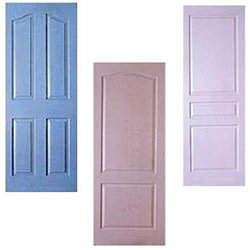 We are indulged in offering Veneer Moulded Door to our clients. Our doors are the best alternative to the traditional solid wooden panel door and have no other alternative in the market in terms of quality and finish. Reckoned in the industry as a prominent organization, we are providing Moulded Door that is dispatched within committed time-period. Being a client-centric organization, we are engaged in offering a wide range of Moulded Door that are designed in sync with the customers' expectations. A molded door has the same structure as that of flush door. The only difference is that the surface material is a molded skin made of HDF / MDF. It is commonly used as interior doors. Profile Specification: Solid Low Density Particle Board Specifically Designed For Industrial Waste Strips. We have gained a remarkable position in the industry by offering a distinguished collection of Moulded Series Door. This comprehensive assortment is manufactured employing progressive technology and superior quality raw material in accordance with the set industry standards.